Antion & Elandra’s 6 Week Course! “home” in Prema room on Tuesdays! Antion & Elandra’s 6 week course is rich in tools, techniques and tips for joyous living and loving in our new paradigm. Antion and Elandra’s Kundalini Yoga is unique and different from most yoga classes – It’s about increasing the power of Love! Antion’s live music with guitar, chant, and heartfelt Hawaiian singing creates a joyous vibration throughout. The opening talk sets the tone for holistic conscious living in the context of the global energy of the times. Each class is different according to the personal needs of the participants. All exercises promote heart-head balance and self-healing power. The focus is primarily on moving your inner energy on all levels by activating and raising prana and chi through the chakras, organs and meridians. Circle sharing with Q &A and hugging time promotes a powerfully supportive group consciousness for the new paradigm New Earth. Mostly exercises are done lying or seated on the floor (soft wool carpet). Eyes are mostly closed to enhance and maximize deeper absorption into the cells and mind. Your water bottle. A towel or comfortable soft mat (sticky mat not needed) to lie on, and something to cover yourself during deep relaxation. Natural fiber (cotton, wool, rayon, silk) is best for your electromagnetic field. If you forget, no worries. Antion & Elandra Meredith are internationally known healers, teachers of teachers, directors of European and Californian Kundalini Yoga Centres, with four decades of experience facilitating Healing and Yoga Trainings and Retreats worldwide. 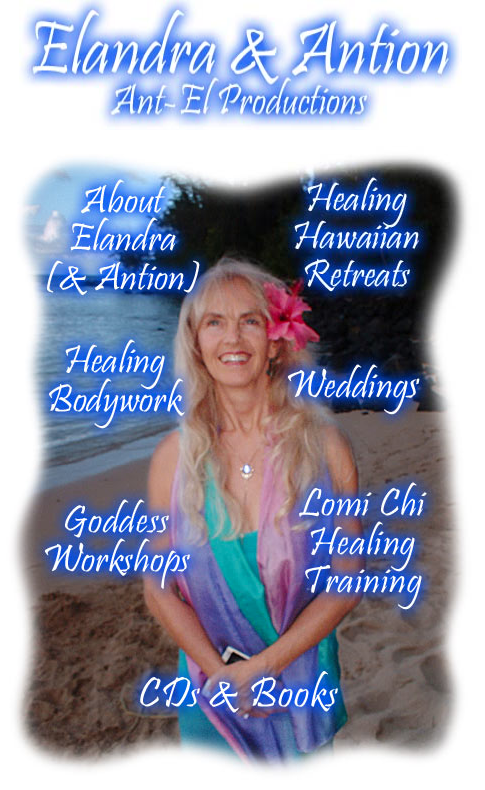 Click image for still relevant information about Elandra's healing sessions and trainings.